A New York newspaper called the Daily Planet appears. The Daily Planet newspaper in New York is not to be confused with the Metropolis paper of the same name, which employs Clark Kent, aka Superman. 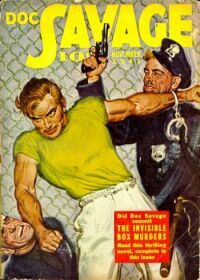 Dent wrote three stories for All Detective Magazine in 1934 featuring Foster Fade, “the Crime Spectacularist,” who worked for a New York newspaper called the Planet. Ok just to clarify in the WNU proper, are Metropolis and Gotham City separate from NYC or they all considered one and the same? For the purposes of the CU, I treat them as separate, since Win's story "Happy Death Men" and the Prince Zarkon books, among others, refer to Gotham as a separate city from New York. It's not every day that you post about a crossover in one of the original pulps! Of course, Dent did have his character Click Rush visit the Continental Detective Agency once. Though this is probably not something worth fighting about. But didn't newspapers back then have different branches in different cities to report on local news as well as national and international? Maybe both Daily Planets belonged to a national newspaper conglomerate that had Daily Planet branches in most major U.S. cities? In fact the Daily Planet was shown to have branches in other cities even overseas in various zsuperman comics as well as episodes of the George Reeves TV series. Maybe Foster Fade worked for the New York branch of the Daily Planet?